I am waiting for a transfer bus to Las Torres. I spent the bus ride from Puerto Natales in a mixture of excitement and impatience – I couldn’t believe the sights I was seeing and I couldn’t wait to start on the trek. I was a little worried as well. They are apparently reluctant to give out solo permits for the circuit. According to the guide books, people have been lost here even in recent years. So in case I had trouble getting a permit, I was going to pretend to be with a group of trekkers who were on the same bus. But I needn’t have worried. The ranger at the entrance station was excited at having a first trekker from India. So much so, that in between repeated exclamations of “primera Indian, primera Indian, he simply waved me in. I cannot get used to the idea that it stays light enough to read at 10 p.m. It doesn’t feel any later than 7 yet it is midnight. 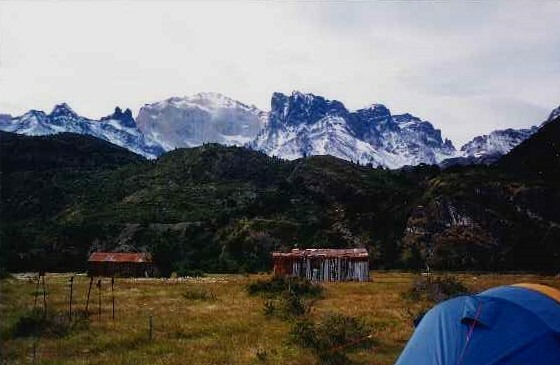 I am at a campsite in a valley between the Paine massif and the Cerro Paine. A hundred feet away the Rio Ascencio, fed by Ventisquero Torres pounds its way down. Hiking in, our progress was noted by the herd of guanacos near the entrance station. The two red foxes on the other hand completely ignored the herd of humans. Mostly level in the beginning, the trail went over a couple of rickety suspension bridges spanning frothing streams below and then started climbing. 600m in 1 km (translates to 1980 ft in 1.3 miles). It is not too bad but with 10 days worth of food and fuel more than once I debated my wisdom. What was I thinking? I hope I use every last thing I’ve brought. Still a good 800 ft above the refugio, I could see silver threads of waterfalls on the walls of the valley, the rushing river beneath and a tiny wooden building at the juncture of two tributaries. I got my first taste of the (in)famous patagonian wind. It’s a good thing that the wind was pushing towards the wall because on the other side was a sheer drop of a thousand meters. The hike to the Torres led uphill through dwarf lenga forests, small streams and creeks and some boulder hopping toward the end. At the top I found myself on the rim of a natural amphitheater, looking down on the tiny meltwater lake at the bottom. Three towers – Torre Monzino (2600m), Torre Central (2800m) and Torre D’Agostini (2850m) rise abruptly like sentinels of polished vertical rock. In between them are glaciers, some of which calve into the lake from time to time with resounding crashed. Ice floes float on the surface. I am back in the valley, planning to head out on the circuit tomorrow. What little sunshine there was today has disappeared. It started raining as I headed down to the valley and the wind has picked up. I hope my tent holds. 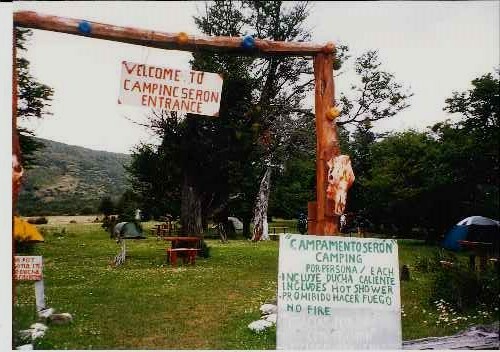 I was talking to the two german men camped at the next site; they are biking their way through South America. Their story of an hour spent chasing their rain fly was liberally sprinkled with “shaize”s! I’m still chuckling over that. Today was supposed to be an easy, level 15 km with some gentle ups and downs. It started out that way. The sweeping panorama to the south became rapidly obscured by clouds and it started drizzling on and off. A lot of streams to cross, muddy patches to go through, waterfalls to gawk at and fields of flowers to walk through. There were entire meadows full of flowers. Daisy-like but larger in size, from a distance they’d look like a white sea waving in the wind. I’d met Koen from Belgium who was hiking the circuit as well and we trekked together, chatting, stopping for breaks now and then. The trouble began after the last crossing. 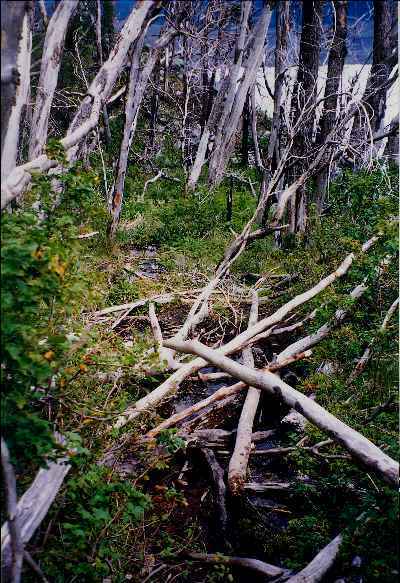 The river level had risen so much that the whole area was a swamp with nary a sign of the trail. We met Ronit and Ariel, a couple from Brazil. They were also headed for Seron and having the same trouble. After two hours of the adventurous route through brambles, thickets, uphill and down, squelching through the swamp, we eventually trailed into camp. It felt good to sit down, cook dinner, chat with the others at the campsite. We all seem to be hiking the circuit in roughly the same times. Most of the people who came in today, lost the trail at the same place. There are a couple of folks who claim they didn’t get lost – not that anyone believes them! Lying warm in my bag inside the tent as I scribble, I can hear them still at it outside – bantering and cackling. Through the marsh initially and then uphill went the trail today. I found berries that look like huckleberries but the bush looks different. These grow taller than one m and have quarter to half inch long thorns. Damn, those are sharp! The berries are seedier and not quite ready for eating yet but who cares? This is trail-lunch. Rounding the northeast corner of the Paine massif I came face to face with a landscape of mountains ending in lakes, the lakes linked by rivers. The mountain-tops are covered by permanent icefields painting an amazing sight. I stood at the corner and drank my fill. “Stood” being a figure of speech. I was hunched over, squeezed in between a rock and a thorn bush to find some shelter from the wind. I can only imagine what this must look like in bright sunshine. Most of the group trailed in by 8 pm. Ronit’s knee in in bad shape; Ariel is arranging for them to go back on horses. I feel bad for Ronit; she did so much want to do this trek. We’ve been discussing over dinner whether to go over the pass tomorrow or wait out the weather. The Pass, the Pass, the dreaded Pass! Koen and possibly Thomas are going to push for Grey tomorrow. I’d much rather get to Los Perros and face the pass the next day. It has been pouring rain, the intensity increasing steadily. We took over the ramshackle building at the outskirts of the Refugion and proceeded to cook our dinners there. As we sat around on borken chairs, benches or squatted on the floor, we sampled each others’ dinners. A batch of Kaisersmarne baked over a whisperlite made a wonderful dessert. That followed by vino tinto for a nightcap – ah, life is good! Two liters between four people was a tad more than a nightcap but who’s counting? An easy level 10 km walk today, mostly among trees. The view of Rio Los Perros cascading down 10 m was spectacular. Another suspension bridge, this one high above the water and I am within sight of the the Glaciar los Perros. There was a profusion of the apple-berry bushes and I can’t seem to go past one without stopping. They look like little red apples – about a cm in diameter and taste like apples too. I am sitting here by the stream luxuriating in some wan sunshine. It felt like heaven to wash up in the creek and then lie on the prickly grass drying out. Marcelo and his girlfriend Sylvia, Henk and Andre joined me in my patch of sun some time ago. We’ve been chatting about hikes in other parts of the world. I’ve been trying to explain the difference between elk and moose to Marcelo by drawing the antlers – definitely preferable to Henk’s attempts at bugling! The weather looks like its going to clear. Most of us are headed over the pass tomorrow and we’ll probably be camped, scattered among El Paso or Los Guardas or Refugion Grey. Sylvia has already declared she’s not going one more step beyond Paso! They’re funny – Marcelo wants to go to Alaska but she’s decided that next vacation is Cancun! Today has quite possibly been one of the hardest day of trekking I have done. I started out at 9 this morning from Los Perros and spent the first hour sinking into knee-deep mud bogs. The marsh near Seron has nothing on this! I sank upto both knees at one time and spent 25 minutes flailing to get out. Then came fording Rio Perros. This was a raging torrent upto mid-thigh, 3 m across and bone chilling cold. The weather was still clear but there were clouds coming in. I didn’t quite make it over the pass in time. A steady climb, by the time I got there it had started snowing. I wasn’t thinking of the snow though. I was too busy staring at the view from the top of the pass. 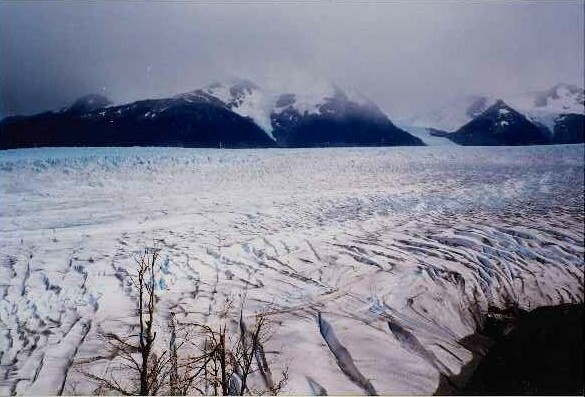 There was the huge sprawling mass of the Hielo Sur ahead of me. It is huge!! 10 to 20 km in breadth and the length easily 3 times as much, it and the Hielo Norte are the only ice caps outside of the earth’s arctic regions. To the west I could see smaller glaciers that feed into the Hielo Sur. Even in the dull grey light I could see the colours in the ice mass. Blue-green and bewitching to view. Crisscrossing it were dark lines – they look like someone tossed out a handful of toothpicks from here but in reality are large, deep crevasses. I couldn’t stay and gawk long though. There was that steep descent that we’d been all talking about. The initial bit above treeline was not too bad. Then I was among the stunted lenga forest once more and the nightmare of a trail began. This is a descent of 800+ m in less than 2 km. The snow had changed to sleet, then rain. It was raining heavily now. The trail was one big mud slide. Slipping, sliding, holding onto branches where possible, falling a couple of times, I made my way down. I realize now why they are reluctant to hand out solo permits. For the first time in my life I was debating the wisdom of soloing. I kept checking my watch – 200m down, 600 more to go; 400 down, 300 more to go. By the time I got to Capamento El Paso my legs were trembling. I had to take a break and sit; they wouldn’t support me anymore. El Paso was one big mud puddle with space enough for 4 small tents. I didn’t want to camp there. The weather played its cat and mouse game – there would be 5 minutes of sunshine sandwiched between rain and sleet. Break over, I started on the trail again. Trail maintainence here is defined quite differently. Since people have been lost in this section even in the recent years, the trail is marked quite well. But they don’t believe in cutting trees or clearing rock falls or building bridges. Perhaps that is why it retains that wild, untamed feel to it? For those of us who are vertically challenged, there is only one way to climb over trees a meter or more in diameter – roll over it somehow and hope not to either land knee deep in mud or slide off the edge of the trail onto the glaciar sparkling below. I lost track of the time it took to get to Los Guardas. A nice enough place but I was so cold and wet that the thought of warmth inside a refugio was tempting. Another two hours on the trail and I limped into the campsite at Refugio Grey. It was 6 pm and I had only taken a 20 minute break today. Henk was already here when I reached. Valerie and Pattris came in a couple of hours after me. Then most of the other folks straggled in – the looks on everyone’s faces said the same thing – what a day! If the refugio had had wine to sell, they could have made a neat profit tonight. But they were all out. Most of us made our way to refugio to jostle for space around the wood stove. It was crowded inside. From those who had intended to stay there and with those who were going to tent but had opted for dry bunks instead. Assorted socks, clothing and boots stood in a bedraggled circle around its perimeter. Sitting, some on benches, some on the floor, some on laps, sipping soups or hot chocolates or pisca, we chatted and listened to a myriad of languages and wrinkled out noses at the ripe smells coming off everyone. I saw Ronit and Ariel again. They had made their way back to the entrance on horses and then to Lago Grey via the “W”. 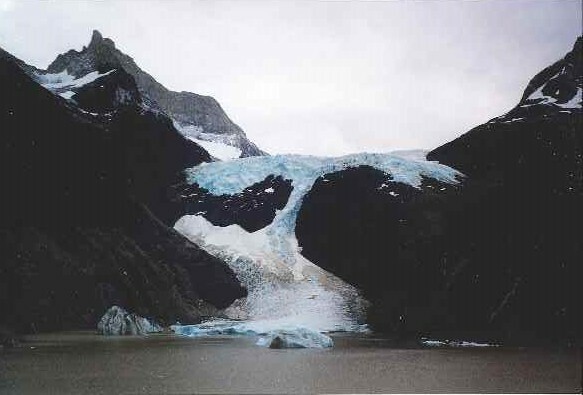 I was glad that Ronit got to see the Glaciar Gray. She had so wanted to see it. It is still raining cats and dogs. I hope it lets up before I break camp tomorrow or I might just stay here one more day. My tent is pitched at the edge of a lake at strewn with ice debris. Every now and then a new chunk, sometimes as big as a house, breaks off and splashes down. The sound is unlike anything I’ve ever heard. Sunshine, sunshine, sunshine!!!! I’m lying sprawled on the scrub scribbling and trying to keep everything from flying off. 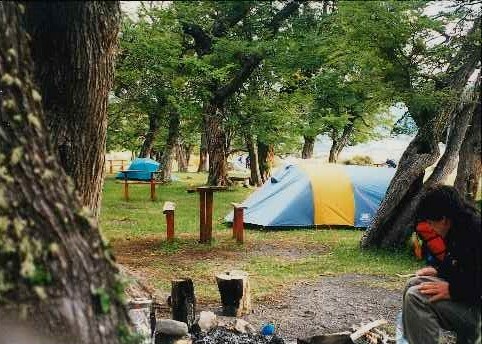 This campsite is on the edge of Lago Pehoe and is the windiest of all the sites to date. I spent a good chunk of time today chasing down my pot lid, mug, clothes that I’d hung to dry and assorted plastic bags. Methinks I’ve definitely exceeded my quota of aerobic activities for the day. The lake is an unbelievable shade of bluish-green, not quite teal, not quite aquamarine. It is mesmerizing. I can see the Torres – this time the west face instead of the east face that I saw a week ago. Tomorrow I head east again, back toward the starting point. Yesterday I’d hung around Grey till well into the afternoon for the rain to let up a little. I finally started out mid afternoon and got to Pehoe at 8 pm or thereabouts. The wind on the pass was strong enough for me to wait out the strongest gusts before walking again. I would look for a small space, underneath a scrub or just a hole in the rock. Enough to wedge myself in and wait out the gust. Once it abated, I’d start out again. I’m planning on hanging out, enjoying the sunshine and going onto the valley Frances tomorrow. 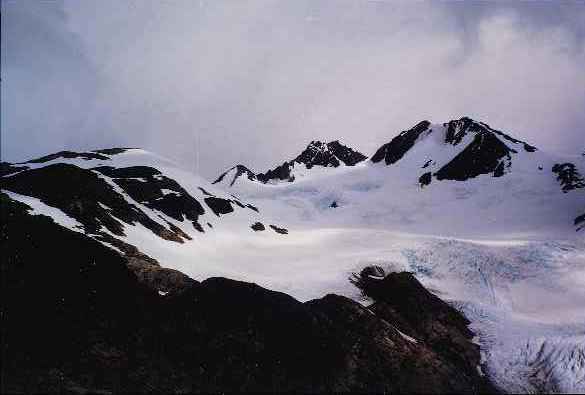 This is one of the ends of the “W” – the popular 3-4 day trek. After seeing nobody on the trails, there are suddenly people all over the place. It is bound to be more so from here on to the end of the circuit. Maybe I’ll opt for the boat out. I’d started out for Campamento Italiano but the weather turned bad again. If I hadn’t known there was a mountain ahead, I wouldn’t believe it now. Everything is a blank white-grey sheet. An hour of trekking toward Italiano and I decided to turn back. Not much point in going to see a view when there isn’t one. So here I am, waiting for the last boat today to Pudeto. From there I can get a bus to Puerto Natales either today or tomorrow. Ah, the thought of a hot shower! The actual elevation of this area is not very high but this is 53-55 degrees south latitude, so the conditions at 1000 m are equivalent to 4000 m in the Rockies. The treeline is barely 700 m. Alaska or northern European countries have terrain and climate is very similar to those places. It is not surprising since they are almost as far north of the equator as this is south. 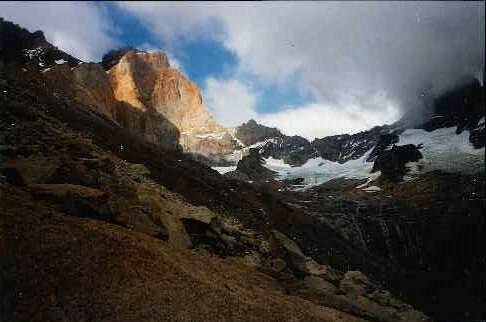 The circuit trek is approx 100-120 km around the Paine massif. There are Refugios at several places. These are huts with bunk beds and meals that one can reserve for a (steep) fee. They are similar to the ski huts in Scandinavian countries. Some also have a little store that stocks wine, beer, cigarettes, chocolates, biscuits. Again at 3 or 4 times the normal prices but that is to be expected. The flowers that look like daisies I learned later are called margaritas. Guanacos are cousin to the Peruvian llama. They have a reddish-brown coat and usually travel and graze in herds. An estimate of how strong the wind is: I came across someone who had been walking along a trail (not even on top of a ridge) and the wind was so strong that it slammed him against the rock wall. He had an eye swollen shut, cuts and abrasions all over and 4 stitches on his head. And this wasn’t a small person – some 80 kgs or so, he was carrying a daypack when this happened.